Magic 2014 features a smaller, more focussed challenge mode than previous years, although it is still fun and can get tricky later on! Our guide provides step by step details for completing each of the challenges by name. As easy as you might expect it to be – simply move to the combat phase, swing with al three creatures, then (it doesn’t matter if blockers are declared or not really) just cast Lightning Blast against the enemy and Unnaturel Predation on your Grave Titan. Done. This is a simple mathematic challenge with a hint of strategy required to ensure you hit home. Cast Golem-Skin Gauntlets, O-Naginata and Trusty Machete. Equip one Silvercoat Lion with all three. Swing for the win. This challenge offers a valuable lesson in misdirection. Attack with all three creatures and wait for blockers to be declared. Now, cast Might of Oaks onto whichever of your creatures was not blocked – you win. In this challenge, the console does most of the work on its own! The enemy will swing at you – use both of your untapped creatures to block one enemy each, which will give you sufficient life gain (from lifelink) to survive the turn. Now attack with your remaining flyer to claim victory. The title of this challenge says it all. A Cudgel Troll is blocking your path; use Doom Blade to try and kill it, which will cause the opponent to regerate it, in turning force it to tap. this will mean that in the attack step, you can easily defeat your undefended foe. You’ll notice things get a little tougher here, but actually things are not as bad as they seem – the thing to note is that you already have a Sliver on the field who provides haste to other Slivers. Cast the Bonescythe Sliver and Predatory Sliver cards. Now move to the attack phase and swing with all your creatures to win. There seem to be a few ways to win this one, so here is a pretty complicated one which definitely counts as a win and should allow you to unlock the ‘heavy hitter’ achievement. First, play the Forest card, the Mossbridge Troll and the Quirion Ranger; then cast Instill Energy on the Mossbridge Troll. Throw the Khalni Hydra out next (as it is cost neutral) and get ready to power up that Troll! Use the Troll’s tap target creature ability to tap the three creatures which you control that have over 10/x power, then use the Quirion Ranger ability to bounce a tapped Forest and untap any of those same 10/x creatures – then use the Troll’s tap target creature ability on that same card again – he should now be at 85/85. Next, press Y to move the game forwards and watch as the console uses his traps to tap the Troll plus three other creatures – as soon as the fourth one is targetted, hit X to pause the game. Now use the Instill Energy enchantment’s activated ability to untap the Troll, hit X again to pause immediately, then use the Troll’s ability to tap targets and use it on the last two creatures you have (which should total over ten power between them) and he will grow to 105/105. Hit X again and cast Berserk on him – making him 210/210. Swing for the win and the achievement! Ugh, more maths! Complicated maths!! The key to victory here is surviving the enemy attack with exactly 1 life, which will activate the autowin ability which the Near-Death Experience enchantment provides. There are a couple of ways to win this one, but the easiest is to keep it simple and use all three of your defending creatures to block the enemies Primordial Hydra. After declaring blockers, hit X to pause and then zoom in on Basandra – Battle Seraph and use her +1/0 ability twice (to give her +2/0). Once all combat is resolved, the lifelink ability which is attached to her and one of the Glory Seekers will return you just enough life to win at the beginning of the next turn. This is an interesting challenge, although not too complex with a bit of thought. Use Stave Off on the Vushok Refugee and protect him from white – this will remove the Pacifism enchantment. Now use Pyroclasm. You’ll note that the Vushok Refugee has protection from red already, so although the giants will survive the Pyroclasm, they are all red and so will be unable to prevent your upcoming attack and subsequent victory. 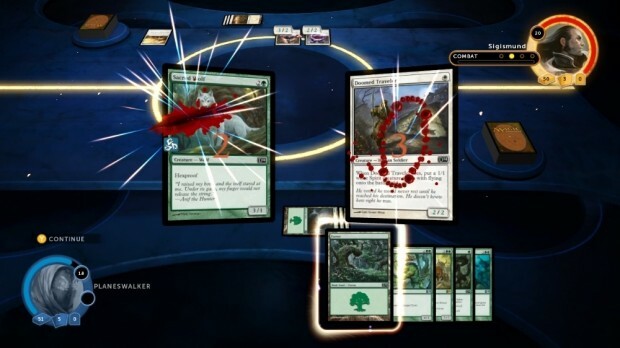 With the possible exception of the achievement-seeking way to defeat Go Berserk, this is far and away the most complex challenge in Magic 2014, if only because it actually provides ways to open up the whole deck for players to explore. Firstly, use Brainstorm. Return Homing Sliver and Tidal Surge to the pile, then cast both of the Virulent Sliver‘s. Now use the Quicksilver Amulet to cast the Protean Hulk, then sacrifice it immediately to the Culling Dais which will activate the Hulk’s ability for you to search for a six mana creature – choose the Predator Dragon, then either bring in all the zero mana creatures or just skip that bit with the Y button. As the Predator Dragon enters, you will be asked to devour (adding tokens to it’s strength) and you need to have him gobble up both of the Virulent Sliver‘s, making him an 8/8. Now use Crib Swap on the enemy Darksteel Gargoyle and voila, swing with your two creatures to win! We really hope you’ve enjoyed this challenge guide and if so, you should definitely check out our other Magic 2014 guides in the links below.